There has been a lot of coverage recently about the rights of divorcees who want to maintain contact with their grandchildren. When a couple break up, it isn't always just about contact with our own children. Our children's children can be as much a part of the break up too. We are living in a society where divorce has become more commonplace, and in the main more accepted as part of modern day living. That said, it doesn't mean divorce has become any easier or nicer and it's especially tough if there is extended family. If a couple had their children at a young age, or there is hereditary longevity, then the likelihood of there being grandchildren when a couple break up or divorce is quite high. If not upon divorce, then sometime after there is likely to be the arrival of a new grandchild. Where this can become complicated is when the two divorced grandparents aren't on good terms with each other, or where there is zero communication between them. Having a new baby in the family is such a beautiful thing. What that baby will experience in its' life, is largely down to its' parents and grandparents. Sadly, sometimes the arrival of a new baby or existing grandchild(ren) is not enough to prompt divorcees to set aside their differences. That may sound selfish, but it happens and it happens for many varied reasons. Sometimes circumstances make it a wiser move to not see each other at all, post break up. On the other hand, many people get along fine during and after divorce (or at least portray that they do). It can work very well if harmony can be achieved. It means that the grandchildren witness a good way to co-exist separately, making emotional stability key, in what would otherwise be quite traumatic times for them. 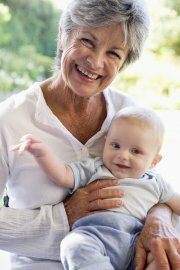 What happens if a person wants to see their grandchild but they have fallen out with their own children before, during or after the divorce? What happens if their ex gets to see the grandchildren and yet they don't, or vice versa? In our own marriages/relationships co-parenting is what we do, in whatever way we do it. Our kids bear witness to what happens within that relationship. They grow up to make their own decisions on how they view us. How we behave towards each other, towards them and towards those around us, can be so very important. If we behave badly, then it could follow that they don't want that atmosphere to continue in their new families' life. As parents we should respect their wishes. They are adults in their own right. So is it fair to say that just because a grandparent feels that they should have a right to see their grandchildren, that they should be able to? Or should we not take that important life decision away from our kids? What are the consequences of keeping feuding grandparents alienated? Firstly there's the family events, where all family members should to be there, such as the birth of a new baby, Christenings, weddings, birthdays, anniversaries, funerals, Christmas, Easter, school plays and so on... These all become really difficult times. A choice has to be made on who can attend, when they can attend or even if they should attend. If not both, then one grandparent will likely not be invited or wanted there. It's quite heartbreaking for anyone to see their own kids have to make these choices. But if a parent lacks self-control and turns nasty towards their ex or their own kids, they indirectly take away the 'choice' side of it. Understandably, no new parent would want what should be a beautiful life event, such as the birth of a new baby, to turn into a nasty stressful mess. As a single grandparent, I can say, that to go through what should be a happy family time alone, because your child doesn't want your ex there, is extremely difficult. To see your child being ecstatically happy, yet with a sadness deep in their eyes, because they are missing what should have been, has got to be one of the worst things for a parent to go through. It's maybe something we never thought we'd see when we originally took our marriage vows. No matter what you feel about your ex, in your heart you know they are also a grandparent. You know they should have a right to be there, but you also know that it would upset your child. You know your kids wouldn't wish what is happening to them on their own child, on that sweet, innocent little life that has just been born. We don't do that to our kids. Right? Lastly, the consequences of alienating a grandparent goes way further than that, it can be a lasting legacy that they and their children are left with. If you are one of a set of grandparents going through this alienation, and it is because of the way you treat your ex. Please do try to think about why your kids might be doing this. Remember that they have had their world ripped apart by divorce. They may have seen you treat another family member wrongly. They are just trying to make a statement and tell you that they didn't being subjected to it. And they don't want you to put their children through the same or similar in any way. And they don't want you there, unless of course, you can behave.